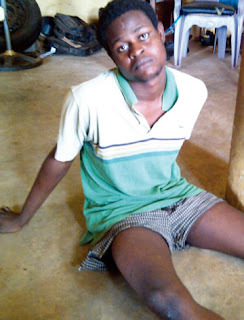 A 27-year-old secondary school dropout, Ismaila Dauda, has been arrested by the Ogun State Police Command for an alleged abduction. Dauda, a fledgling actor, based in Ondo, was accused of attempting to abduct the wife of the traditional ruler of Ilisan Remo in March 2013, with the help of three others- Segun, Nurudeen and an unidentified man. However, Dauda said he was not aware that he was part of a gang of kidnappers until too late. He said, “At the time, I was not aware that it was a planned abduction. Segun is a close friend and had borrowed my car. Because the car was without a spare tyre and not in good condition, I offered to drive him wherever he wanted. “I was under the impression that Segun was in search of a suitable school for his teaching practice as he is a student of a College of Education,” Dauda said. Dauda, Segun and Nurudeen allegedly left Ondo, while a fourth unidentified man was picked up at Ore. Under Segun’s direction, Dauda allegedly drove to a secondary school close to the palace of the Oba of Ilisan in Ogun State. At about 1pm, an elderly lady was said to have driven out of the school compound and headed in the direction of the king’s palace. Their victim was bundled into Dauda’s waiting car and driven away. Some residents, however, raised the alarm and alerted the police after witnessing the abduction. “It seemed Segun had stationed some spies around because while I was driving, he received a call that the police had already begun to give a chase behind us and that the neighbourhod vigilantes had mobilised ahead of us to block our escape. “Immediately, I heard that, I could no longer drive. I was so scared, I had to drive off the road into the bush and we abandoned my car there with the king’s wife in it,” Dauda recalled. Dauda and his friends, allegedly hid in the bush till 7pm until Segun’s spies showed up and took them all to an uncompleted building at the Ijebu-Ode end of Sagamu-Benin Expressway. The suspects were said to have hidden there till 6.30am the following day, when a vehicle arrived to convey them back to Ondo state. The Ogun State Police Public Relations Officer, Mr. Muyiwa Adejobi, confirming the incident said, “The victim was rescued from the car unhurt although some pepper had been sprayed into her eyes to prevent her from identifying where she was to be held captive. “All the suspects escaped from the scene. In their haste, a sim card belonging to Dauda was left in the car.